Blocks of text build the foundation of your web page. You use blocks of text to create such things as headings, paragraphs, and lists. You can break those blocks into smaller pieces to better guide readers through your content. and the rest of us would have to settle for something else. Most web browsers display block quote content with a slight left indent, as shown in in this figure. The following markup includes various hard returns, line breaks, and lots of spaces. The figure shows that the web browser ignores all of this. The preformatted text element (<pre>) instructs browsers to keep all white space intact while it displays your content. (As shown in the code sample.) Use the <pre> element in place of the <p> element to make the browser apply all your white space, as shown in the figure. thrown in for fun (and as a test of course). 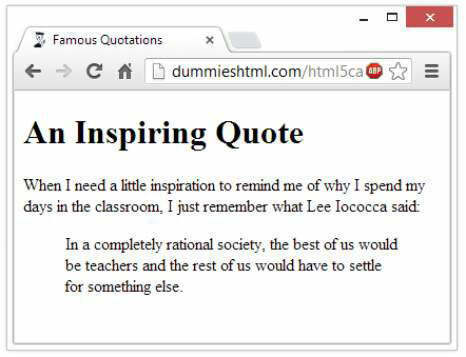 You could nest <pre> elements inside <blockquote> elements to carefully control how lines of quoted text appear on the page. Or better yet, forget about these tags and use CSS to position text blocks inside <div> elements. 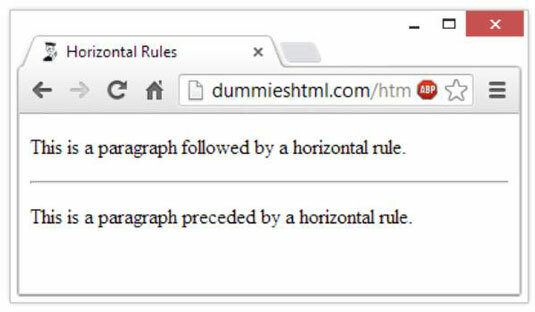 Using a horizontal rule element (hr) lets you include solid straight lines called rules on your page. Break a page into logical sections. Separate headers and footers from the rest of the page. 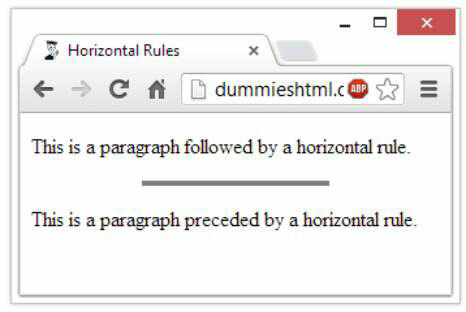 When you include an <hr> element on your page, as in the following HTML, the browser replaces it with a line, as shown in the figure. A horizontal rule always sits on a line by itself; you can’t add the <hr> element in the middle of a paragraph (or other block element) and expect the rule to appear in the middle of the block.